A 2013 photo shows the Furnace Creek Visitor Center thermometer. It reached 127 degrees Fahrenheit four times in July 2018. Through the first 30 days of July, the average temperature there has been 108 degrees Fahrenheit. The forecast on Tuesday—the last day of the month—calls for a high of 120 degrees Fahrenheit and a low of 92 degrees Fahrenheit. If that holds, Death Valley will end July with an average temperature of 107.94 degrees Fahrenheit and a place in the history books for the hottest month reliably recorded anywhere (pending official review of course). It will take the spot of... Death Valley, which set the record last year with a July average of 107.4 degrees Fahrenheit. Hell will basically have to freeze over to keep the site from beating its previous world record. 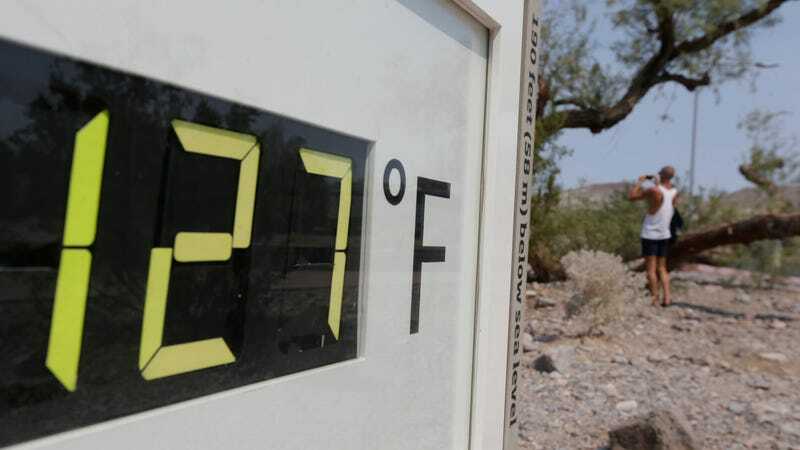 The temperature at Furnace Creek, the site of the weather station, would have to average 90 degrees Fahrenheit today. As of 10 a.m. local time, it was up to 107 degrees Fahrenheit, so I’d say that ship is rapidly sailing away. Tourists have flocked to Badwater Basin, the lowest point in North America that’s also the epicenter of the extreme heat. Masochists have posed next to the visitor center’s digital thermometer and even gone for a jog, which sounds torturous. Well, you got it, buddy. But in all seriousness, the extremes at Death Valley are no joke. At least one visitor has died this month from the heat, according to the Review Journal, underscoring that you need to take care of yourself and heed warning signs in hot weather. 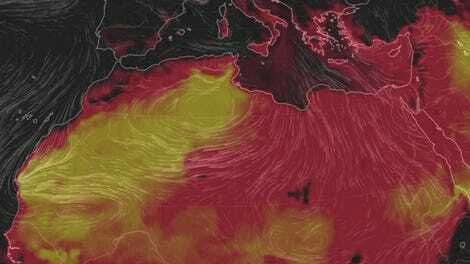 July has been a month of wild heat waves that have engulfed the high Arctic, Japan, North Africa, and much of Europe. Scientists have already shown that climate change made the European heat wave more likely, and it wouldn’t be surprising in the least that the other heat waves are also linked to global warming. Rising background temperatures can amplify heat waves’ intensity and make them more common. He noted that while the ridge’s intensity isn’t a record setter, it’s persistence for a whole month is what sets it apart and has helped Death Valley reach a new record. Some research has shown that climate change is making the jet stream wavier, though there’s been no specific research looking at the pattern this summer yet. As the calendar turns to August, it appears the waviness could finally break, over the Southwest at least. Czyzyk said this weekend could yield cooler temperatures that could even dip below average next week. So if you’re the masochistic type that would rather revel in the heat than beat it, you better get to Death Valley ASAP.